All Alexa skills submitted for publication go through an Amazon Skill Certification process. This process ensures that we provide customers quality content in the Alexa Skills Catalog and that we help you deliver the highest quality experience possible. While we have Voice Experience and User Experience Guidelines available, I wanted to point out an area many skills have consistently been failing certification on. It is my hope that you can avoid the same problem when creating your skill’s Example Phrases. As part of your skill’s description, we ask you to provide three Example Phrases for customers teaching them how to interact with your skill. The first phrase should be the easiest way to get started with your skill. 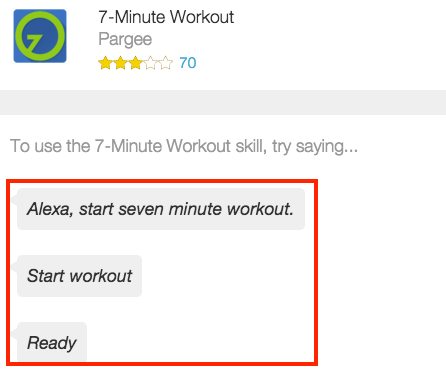 It will be displayed with the short skill description in the main list of skills in the Alexa App. All three of these Example Phrases must be included exactly as written in your skill’s Sample Utterances. All three of the Example Phrases you provide will be displayed on the skill’s detail card inside the Alexa App. A good process to follow is to pull your Example Phrases directly from your Sample Utterances. This will ensure that when a customer invokes your skill they will be heard with a high degree of accuracy. Finally, if you are referencing a Custom Slot in your Example Phrases, the Example Phrase must reference word(s) present in the Custom Slot. For additional details please check the Alexa Skill Submission Checklist and the Alexa Skills Kit Knowledge Base.